USPSA Open Division SV 170mm Magazines are EXPENSIVE!! After switching the top-end of my Open Gun to 9mm Major, one of the problems I’ve been having is magazines. I only have three 170mm magazines and one of them is a SPS version which although reliable with 38 super, is not with 9mm major because of the overall length (OAL) and the rim in the case. The most reliable magazines are the STI and SV magazines. With the STI, you need an additional “spacer” to make the magazines work with 9mm Major. 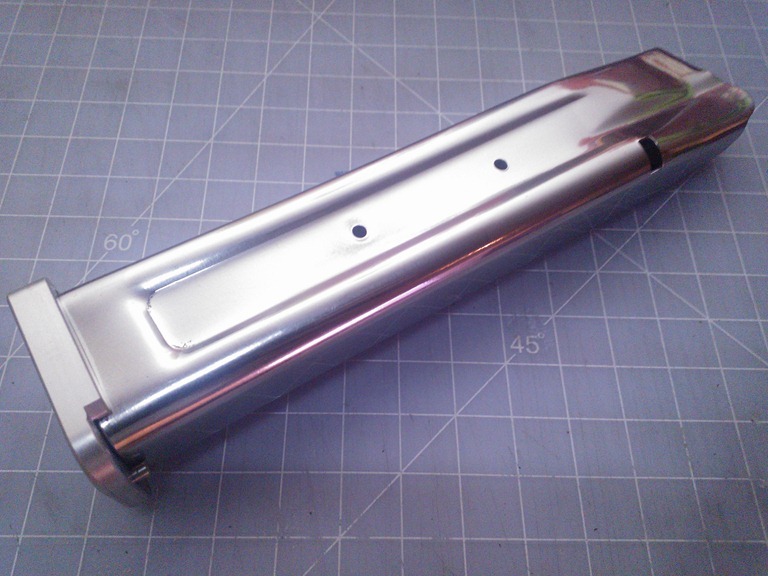 For SV, you don’t need to because of the construction of the magazine tube. I chose to go with all SVs so I don’t have to mess with adding spacers. 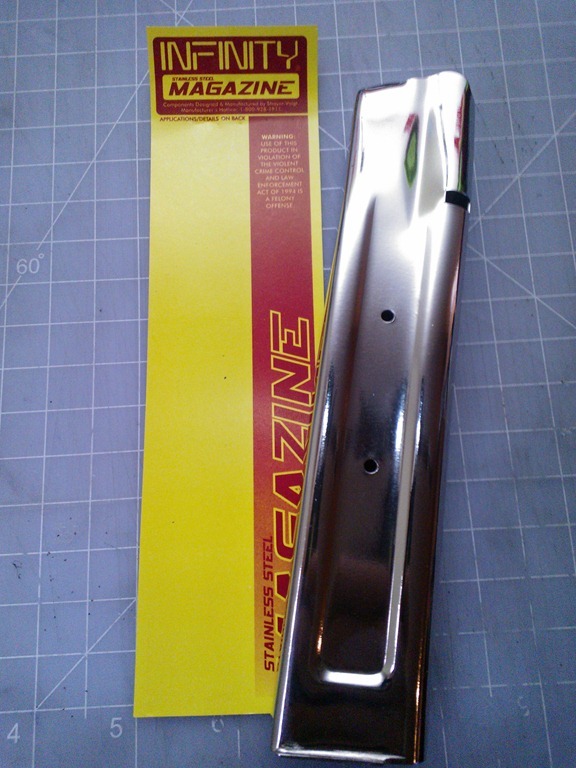 I found a seller online who still had the old style SV magazine tubes and got them for $150. yes, $150 just for the tube!! The best combination for maximum number of rounds is the SV tube, Grams 13 coil spring + Follower and the Bolens 3mm basepad. Ordered those parts from Shooters Connection for another $60. $210 for ONE magazine. Yes, shooting USPSA Open Division is bloody expensive!!! Ever since I got my Open Gun, I’ve been cleaning it religiously. The first time I cleaned it, I detail stripped it and cleaned every little thing I could. After that time, I’ve only “field” stripped and cleaned the gun to a shine. I’ve never bothered to remove the extractor to clean it or it’s channel. After the last match this Sunday, I decided to remove the extractor and clean it just in case I start to develop extraction problems. The extractor itself isn’t too dirty, but look at how frigging dirty the extractor channel is? I drove a cue tip in to clean it and this came out. And that small black bit next to my slide? that’s from the channel too. I’ve only shot maybe, 1,500 rounds through the gun after the first detail strip? 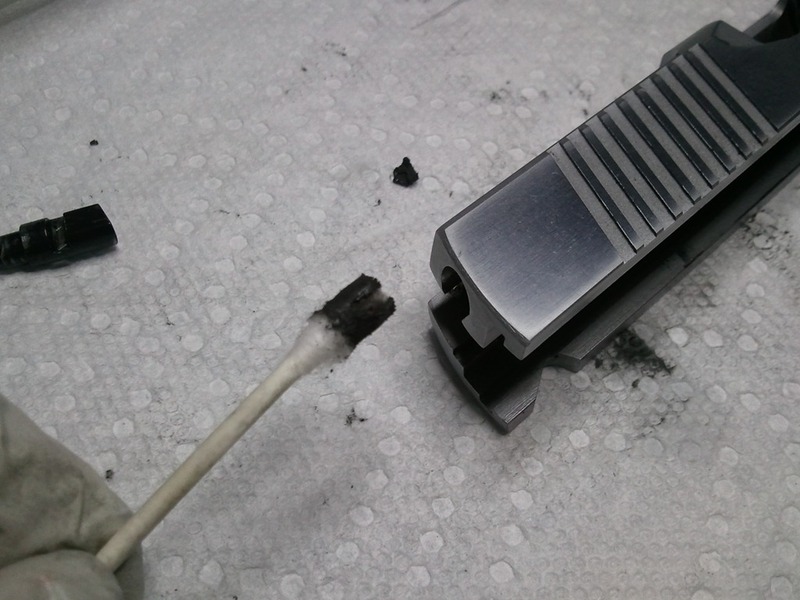 So remember to clean the extractor channel from time to time, especially in Open Guns. One failure to feed or extract will cost you to lose the stage. I’ve wanted to do this for a long time, as many people have been talking about dot tracking in open guns and how to tune a flat shooting gun. I thought I’d try to take high-speed video of the dot in my open gun while shooting various loads of .38 Super Comp that i’ve pre-loaded. To see how the dot jumps and settles back into view. The dream pattern, is for the dot to jump straight up without leaving the lens, and settling back down in the middle. As you can see from the video, that’s definitely not what I see. My dot goes up to 12 o’clock, drives all the way down to 6 o’clock, then back to 12 and settling in the middle. I don’t see any noticeable difference in the dot movement between all the loads except feeling a "softer" recoil in the 124gr CMJ loads. Caveat: I had to shoot in a slightly weird stance because I had to position the scope in front of my Casio Exlim FH100 camera to align it properly. That definitely affected my recoil management capabilities. I’ve also tried shooting at a man-sized target at 200yards and was amazed at how accurate this gun was. That’s in the bonus section at the end of the video.